> E3 Aftermath - New Type, Pokémon and Features! Following the annual Nintendo E3 Conference, it has been announced that the sixth Generation of Pokémon games, of which Pokémon X and Y are to be the debut titles to be released worldwide in October 2013, will debut a new, eighteenth Pokémon type; Fairy. There are also Pokémon from previous Pokémon games that will be reclassified as Fairy-type Pokémon, of which Gardevoir, Marill and Jigglypuff have been confirmed to now have a secondary typing of Fairy - Psychic/Fairy, Water/Fairy and Normal/Fairy respectively - along with the revelation that Sylveon is also of such typing. There is nothing to suggest these are the only older Pokémon to be given the new secondary typing, there are certainly a few suspect Pokémon which could possibly benefit from such. Super effective against the feared Dragon typing, the new Fairy type will certainly be interesting to see just how much of a balance it can provide. Also shown are three new moves, Fairy Wind, Moon Blast and Boom Burst, the latter being of Normal typing with the other two, predictably, being of the new Fairy type. The video, shown at the E3 Conference, reveals a number of new Pokémon, further supplemented by Coro Coro's reveals which were released shortly after along with new features that are to be included into the new games. It also reveals a new battling scenario; Sky Battles! Open to only Pokémon with a Flying type or that possess the Levitate type, the Sky Battles predictably take place in the Sky. Unfortunately, this is the extent of the information we currently have. "Show your Pokémon some love with the new Pokémon-Amie feature! Play with your Pokémon, give them treats, and even scratch and pet them using the Nintendo 3DS or Nintendo 3DS XL system's Touch Screen. You can use Pokémon-Amie at any time to play with the Pokémon that are in your team. You'll need to play with them over and over to learn their preferred way of being cared for. Treat them well to make them feel loved. Treat them badly, and they may show their displeasure! The more you play with your Pokémon, the friendlier they will become. Friendly Pokémon may perform better in battle, and maybe other good things will happen, too!" - Pet Pikachu in just the right way to make it happy! - The Pokémon may attempt to mimic your movements. - Tilt your head to see the Pokémon react! - If you get a bad reaction, you may want to change your approach! - There are many ways to interact with your Pokémon—you can even give them a high five! - Pokémon you've played with may turn to you in battle and wait for your orders. - How will Pokémon-Amie affect your Pokémon's performance? - Even fierce-looking Pokémon will loosen up a bit with the right treatment! - Large Pokémon take up both screens of your Nintendo 3DS system. I wonder how long it'll take until somebody is reported to the police for inappropriate.. yeah. Hey-ho! You can use the 3DS's front camera to mimic your Pokémon's facial reactions in the Pokémon-Amie, although we at PKMN.net have to wonder how this'll be for Pokémon such as Nosepass and Magnezone..
"Noivern is extremely combative toward anything that wanders too close to it. It flies through even the darkest nights using ultrasonic waves it emits from its ears. This Pokémon loves fruit, and feeding it fruit will keep it calm." Noivern is the first new Pokémon revealed in this update. Seen using the new move 'Boomburst' in the preview video as above, Noivern is a Flying/Dragon Pokémon (curiously, Flying type as it's primary typing as opposed to the norm of being Dragon/Flying, although this may just be an error or mistranslation) standing at 4'11'' and weighing 187.4lbs for those who still have faith in the Poké-Physics. Apparently, the waves Noivern emits from its ears are strong enough to reduce large boulders to rubble. Hit all other Pokémon in battle, including allies, with Noivern's Boomburst move, a new and powerful attack! Cool. "The Bug- and Flying-type Pokémon Vivillon uses its wings to scatter its scales or create a strong wind to attack. Vivillon is said to have a secret hidden in the colorful decorative pattern on its wings." 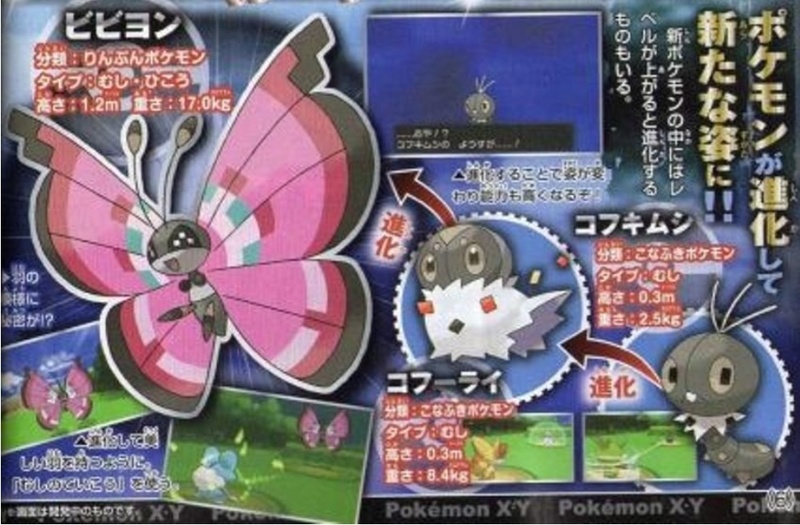 The second Pokémon to be revealed in this update is Vivillon, a fully evolved Bug/Flying Pokémon. Elegantly displaying the move, Vivillon comes before us at 3'11'' and 37.5lbs. "Vivillon can use its wings to blow up a strong wind to attack. Attack with Vivillon's Struggle Bug move, which will lower its targets' Special Attack. It's useful for long battles!" Although why you'd take a butterfly to a gun-fight I'll never know.. 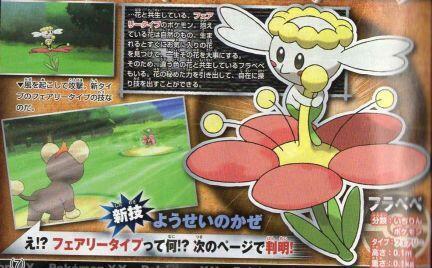 The rather strange, almost Pikmin looking Pokémon as seen above is Furabebe, the Single Flower Pokémon. Another associate of the new Fairy type, it weighs just 0.1kg and is only 10cm tall. Apparently, when it is born it instantly discovers it's favourite flower and holds onto it for it's whole life, working in Symbiosis with it. Notice how it's of a different colour to it's flower. It apparently has the power to hide itself in and manipulate the flower. 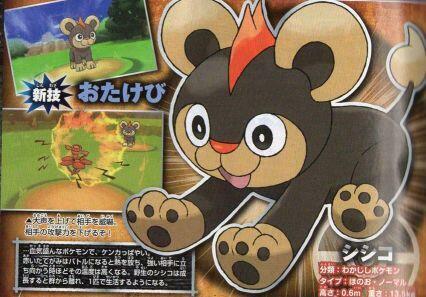 Sounds quite.. cool, until somebody lets their Growlithe off of it's leash and it goes to mark it's territory.. oo-er..
Shishiko, the young lion Pokémon, is the next revealed in Coro Coro. A Fire/Normal Pokémon, Shishiko uses a new move apparently called 'Warcry' which lowers the opponent's attack, whilst it's red mane apparently flares up in battles and gets extra-hot when facing a tough opponent. At 0.6m and 13.5kg, it is but a pup-Pokémon, but as they grow older they separate from their pack and live alone. From left to right, here we have Vivillon, Kofuurai and Kofukimushi. Kofukimushi and Kofuurai, of which I assume have yet to be given an English name, are pure Bug Pokémon which eventually evolve into Vivillon, known to be Bug/Flying. Kofukimushi is 0.3m and weighs 2.5kg, Kofuurai is 0.3m and weighs 8.4kg. So now you know! For all discussion, updates and news as we get it, please see our Pokémon X&Y board on the forums! Specstile on Fri 14 Jun 2013 22:30:15 UTC. steelix5150 on Fri 14 Jun 2013 22:54:14 UTC. I am second to comment! well, I know what's going to be next. puppylad951 on Sat 15 Jun 2013 07:02:16 UTC. Now, the males of said fairy pokemon get to be that much more awkward. Congrats, Nintendo. SecretSnivy on Wed 04 Sep 2013 13:46:12 UTC. Raven of Fire on Thu 02 Jan 2014 01:25:40 UTC. Page generated with 18 queries, excitingly.